When you’re on a tight budget but you have children to feed, eating fresh food — which often expires quickly and comes with a hefty price tag — often takes a backseat to longer-lasting and cheaper processed food. But the drop in price tends to come with an equally steep drop in nutritional value. The Supplemental Nutrition Assistance Program, better known as food stamps, can mean the difference between feeding your family a healthy dinner and going to bed hungry. But SNAP benefits were never designed to fund a family’s full food budget. A family of four could qualify for up to $649 per month under SNAP, but that amount only goes to families that have no monthly income. Most of the 48 million people who qualify for SNAP bring in some form of income, so they get less than the maximum amount. According to the Center on Budget and Policy Priorities, a nonpartisan, nonprofit organization that examines government spending, the average allotment for families that use SNAP is closer to $255. And if you’re a family of three that brings in just over $26,000 a year? You don’t qualify for SNAP benefits. Regardless of whether you get SNAP benefits, stretching your monthly grocery budget to make sure there is enough to feed your whole family takes skill. Of course, with limited budgets, low-income families have to get creative if they want to eat healthy, fresh food. We compiled a few tips from entrepreneur and mom Rachel Bolden-Kramer, author of the upcoming “My Food Stamps Cookbook,” and nutrition advocate Cooking Matters to show you — whether you qualify for SNAP benefits or are just on a budget — how to get a little more with less. While you can use some of these tips in grocery stores, the more involved you are in your community, the more you can benefit. Community-supported agriculture allows community members to pay weekly, monthly or seasonal fees to support local farmers. In exchange for the periodic payments, community members can pick up a heaping box of fresh produce each week. 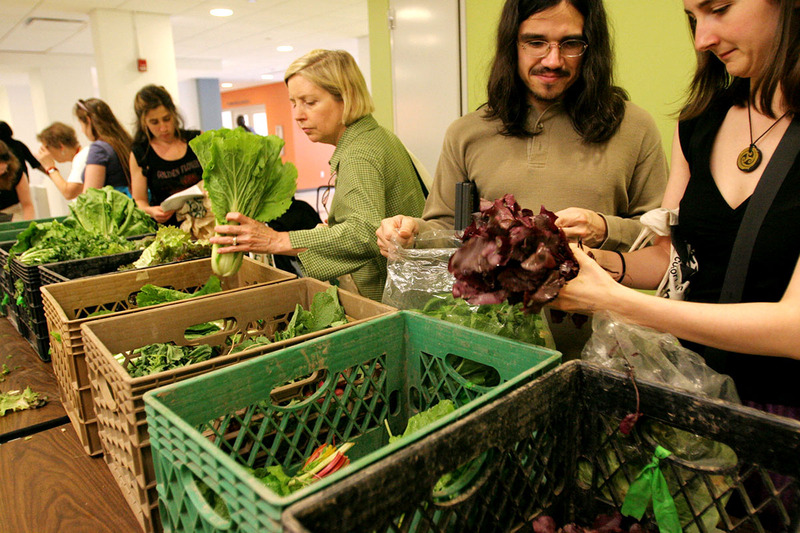 LocalHarvest.org keeps an extensive list of CSA programs nationwide. Just in St. Petersburg, Florida, where our office is located, and surrounding counties, there are 32 CSA programs. Prices vary, and not all CSAs accept food stamps, so it might take some legwork to figure out what program is right for you. But once you find the right one, the weekly boxes could cut down your spending at grocery stores. Even if you don’t use food stamps, joining a CSA could be a solid money-saving trick. As a bonus, joining a CSA also gives you a chance to learn about the farmers who grow your food and their practices — all while getting your children more excited about eating vegetables. Community or neighborhood gardens are different from CSAs. While full-time farmers generally run CSAs, neighbors donate their time and money to maintain most community gardens. According to Bolden-Kramer, it’s possible to buy discounted produce from neighborhood farms, and some also give community members who use food stamps free greens and herbs to help them stretch their budgets and elevate meals. We’ve already got a slew of tips on how you can stretch your dollars at your local farmers market, even if you don’t quality for food stamps. If you do qualify, many states offer programs that help low-income families get more produce for their dollar. In California, where Bolden-Kramer lives, the program is called Market Match. Through this program, for each dollar a SNAP beneficiary spends at a participating farmers market, they get another dollar they can spend at the farmers market. A quick Google search will tell you if your state has a similar program. For example, in our home state of Florida, the program is called Fresh Access Bucks. Of course, there will be times when you need something you can’t find at a farmers market, CSA or community garden. That’s when you’ll have to head to a traditional grocery store. Cooking Matters, an organization dedicated to teaching families how to stretch small food budgets, has some ideas on how to better navigate a grocery store and keep your budget intact. The organization suggests opting for frozen vegetables when fresh produce feels out of reach, meal planning to cut down on food waste and comparing unit prices so you can pay the least amount of money for the best food options. We already wrote about Amazon’s recent decision to lower the cost of its monthly Prime membership for people on government assistance. Instead of paying $10.99 a month for membership, you would pay $5.99 each month as long as you have a valid Electronic Benefit Transfer card. While you can’t use your EBT card to make purchases through Amazon, you do get free shipping on items you purchase through the site. This could save you money on transportation costs if you don’t have access to a reliable car but need to purchase large or heavy items. The Prime discount is only available for monthly memberships, and you can cancel it any time.